If you are searching for an alternative to a cooking school in Hua Hin, this might be just what you are looking for. This popular tour is for the 'true foodie' and incorporates around 15 handpicked tastings which provide an insight into the varied flavours of Thai cuisine. 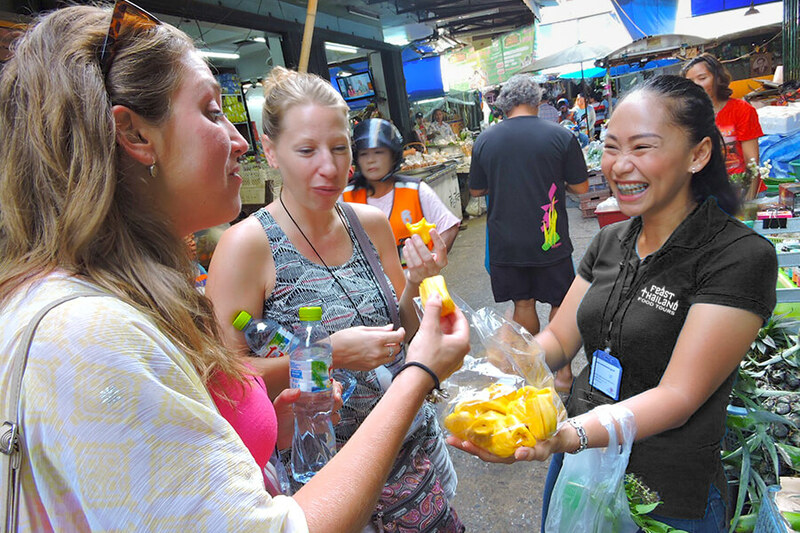 This 3½ hour walking tour includes a traditional Thai breakfast, fresh produce market exploration, Southern and vibrant Isaan (NorthEastern) food and many more tastes along the way. After hotel pickup, start your food journey in Hua Hin with a traditional Thai breakfast of Jok Muu served with Thai coffee with condensed milk, Café Boran. Also try the delicious Bpaa Thong Gor • Thai Donuts, before a casual stroll over to Hua Hin's Chat Chai fresh produce market to explore what the vendors have to offer. The sights, sounds, and smells of this lively, almost century-old market are thoroughly enticing. Sample tropical fruits such as mangosteen, jackfruit, dragonfruit, longan and rambutan. Taste food cooked or prepared fresh in and around the market and designed to feed hungry locals who love to graze all day. Afterwards, take a leisurely walk to meet a couple of ladies who have been serving some of Hua Hin's best fried banana for over 70 years. These gals are the perfect photo opportunity. Then we hit the streets of Hua Hin, tasting as we go, while learning about what makes Thai food so good. This walking tour covers about 1 mile (2.5 km) in 3½ hours. Hear tips on choosing the best dishes and meet some of the street vendors who have been feeding locals and travellers for generations. After a short walk, you'll encounter a vendor selling Southern Thai Cuisine. Khun Goong introduces you to the pungent flavours of spices such as turmeric as you try Khua Kling • Dry Yellow Minced Pork Curry, Muu Wan • Sweet Pork and Gaeng Leuang Gai aka Gaeng Som Gai • Yellow Chicken Curry. After that, we walk a short distance to a local food hero - Ratama, to try the most succulent braised duck called Bpet Peloe. Slightly further on is our final stop, Baan Thong Kham, where you will try food from Isaan - the NorthEast. Here you will have a chance to make and taste Som Dtam • Green Papaya Salad, which is practically the national dish. Discover Nam Jim, the dipping sauces that bring it all together at the table, along with Khao Niaw • Sticky Rice. You'll sample around 15 Thai snacks, salads, fruits, desserts and drinks, along with a few surprises, with numerous rest breaks to recharge. Gain insider knowledge from your guide and return to your hotel with new culinary expertise. If you are searching for an alternative to a cooking school in Hua Hin, this might be just what you are looking for. This popular tour is for the 'true foodie' and incorporates around 15 handpicked tastings which provide an insight into the varied flavours of Thai cuisine. This 3½ hour walking tour includes a traditional Thai breakfast, fresh produce market exploration, spice-laden Southern and vibrant Isaan (NorthEastern) food and many more tastes along the way. After hotel pickup, start your food journey in Hua Hin with a traditional Thai breakfast of Jok Muu served with Thai coffee with condensed milk, Café Boran. Also try the delicious Bpaa Thong Gor • Thai Donuts, before a casual stroll over to Hua Hin's Chat Chai fresh produce market to explore what the vendors have to offer. The sights, sounds, and smells of this lively, almost century-old market are thoroughly enticing. Sample tropical fruits such as mangosteen, jackfruit, dragonfruit, longan and rambutan, or whatever is in season. Taste food cooked or prepared fresh in and around the market and designed to feed hungry locals who love to graze all day. Afterwards, take a leisurely walk to meet a couple of ladies who have been serving some of Hua Hin's best fried banana for over 70 years. These gals are the perfect photo opportunity. After a short walk, you'll encounter a vendor selling Southern Thai Cuisine. Khun Goong introduces you to the pungent flavours of spices such as turmeric as you try Khua Kling • Dry Yellow Minced Pork Curry, Muu Wan • Sweet Pork and Gaeng Leuang Gai aka Gaeng Som Gai • Sour Yellow Chicken Curry. After that, we walk a short distance to a local food hero - Ratama, to try the most succulent braised duck called Bpet Peloe. Slightly further on is our final stop, Baan Thong Kham, where you will try food from Isaan - the NorthEast. Here you will have a chance to make and taste Som Dtam • Green Papaya Salad, which is practically the national dish. Discover Nam Jim, the various dipping sauces that bring it all together at the table, along with Khao Niaw • Sticky Rice.